The Second Largest Pizza In Arkansas Can Be Found at Magic Springs. 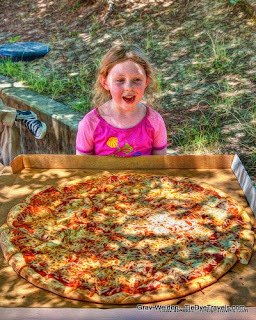 Do you know where the largest pizza in Arkansas can be found? Some believe it’s at Rod’s Pizza Cellar in Hot Springs, where the Godfather spans 17 inches. Damgoode Pie’s largest pizza is 18 inches. 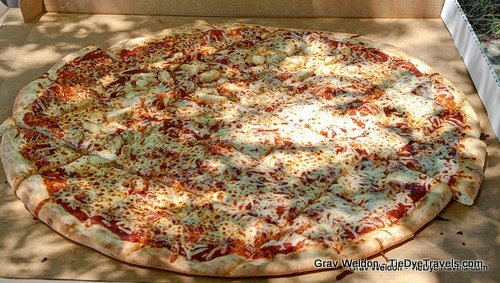 For most other Arkansas pizzerias, the top pie is 16 inches across (that includes Large Mouth Pizza in Greer’s Ferry, Iriana’s and Vino’s Brewpub in Little Rock and Tommy’s Famous A Pizzeria in Mountain View). But there’s one pizza out there that’s a whopping 29 inches across. That pizza can be found at a restaurant called the Blue Canoe Company, which stands right next to the wave pool at Magic Springs Theme Park in Hot Springs. The pizzas take around 20 minutes to cook, but they’re popular and the park sells several of them every day. A 29 inch pizza? Why would you want a 29 inch pizza? For groups on a budget, it’s a good choice. The pizza is sliced square into around 30 pieces, and since it’s a round pie, you get pieces of different sizes, some with crust and some without. On request, the pizza can be sliced differently, even smaller, to make it easier for smaller hands to handle. The pie easily feeds 10 adults, but could be used to feed even more kids. For parents and chaperones looking for a great way to provide lunch while on-park, it’s a winner. Pizza toppings range include pepperoni, chicken, sausage or just plain cheese. The cheese pizza is $44.99. Toppings are additional. Dining on one of these pies is an al fresco situation, but that’s all right – there are several tables the perfect size for this pizza within steps of the Blue Canoe Company. Magic Springs is open every day between now and August 16th. For more information, check out MagicSprings.com. And see how our trip to Magic Springs went, here. UPDATE 11/3/17: We found one bigger.